The first 12 miles of this route are almost entirely on a beautiful, flat, dedicated bike path through the woods. The rest of the route is along roadways with bike lanes and only two or three large hills. However, the entire second half of the ride is a very gradual uphill climb, and the occasional dirt/gravel path during the last 5 miles. 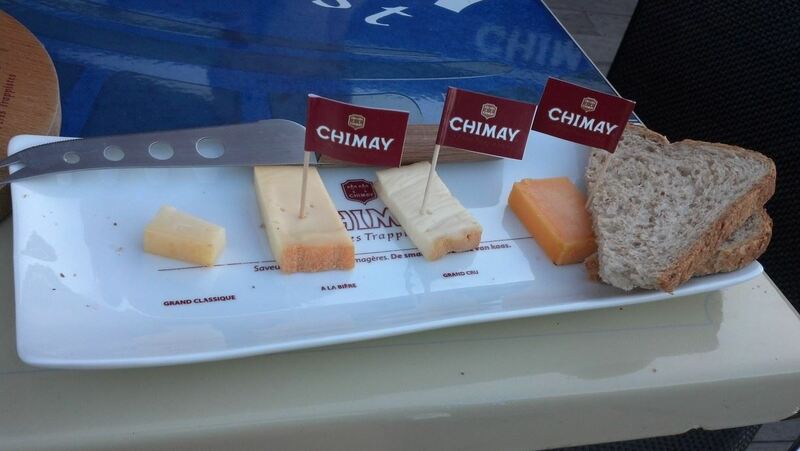 Chimay is probably the best known of the Trappist beers. Their beers can be found all over the world, which is mostly due to Chimay being the first Trappist brewery to get serious about distributing and selling their beer commercially. Chimay was the first Trappist brewery to bottle, make their beer available outside the monastery, and use the Trappist label as a form of brand. Chimay also exports more beer than any of the other Trappists, with a little more than 35,000 barrels being exported every year. With that being said, Chimay is my least favorite of the Trappists, but that doesn’t mean the beer isn’t good. In fact, this trip has taught me that most of my issues with Chimay likely come from the way the beer is handled by distributors and bars here in the US. But before we get into the details of the beer, we need to earn them. On to the ride! 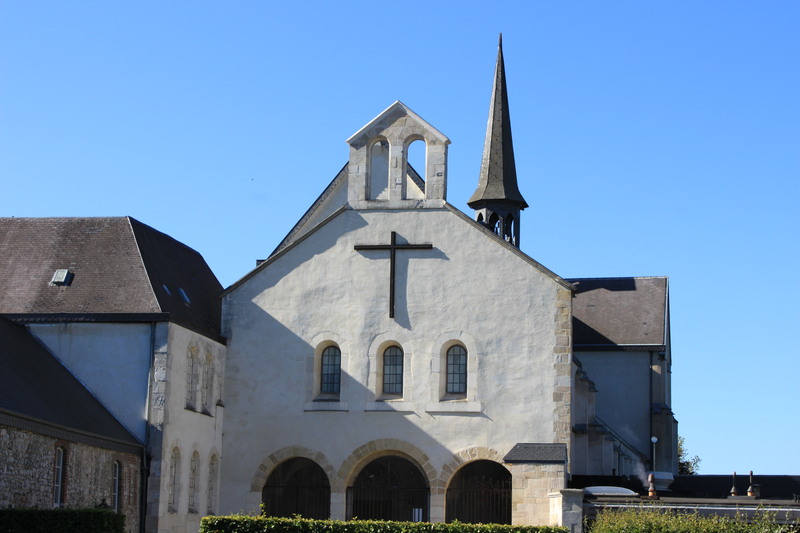 We decided to ride past the Rochefort Abbey on the way out of town. Not much to see there! Not much to see or do here, but it’s a nice short ride from town. The 50+ mile ride was fairly uneventful. We crossed into France, peed on France, left France, etc. We managed to avoid most of the hills on our way to Chimay, but today’s ride was incredibly hot and sunny. It was in the mid-80s and there wasn’t much shade on our route. We took a wrong turn (technically it was on the route Google suggested but Google failed) and ended up on a gravel road with a really steep incline. A local man was working in his garden and stopped us to ask where we were going. He gave us a better route and refilled our nearly depleted water bottles. The last 6 miles (10 kms) to Chimay were terrible. Apparently in French border towns, bike trails also double as unpaved cattle trails. It was so bumpy, I’m shocked our panniers stayed on the bikes and I think my internal organs have shifted in my body. 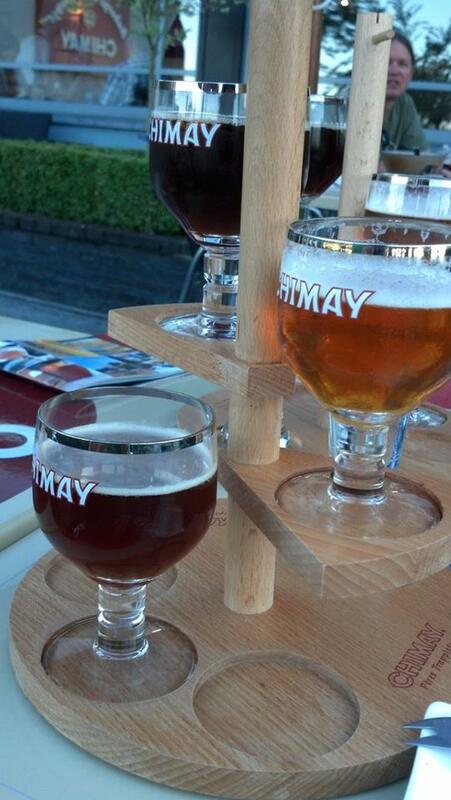 When we arrived at Chimay we were dehydrated and burned to a crisp (we decided not to pack sunscreen–poor choice). The food and the beer were well deserved and, oh so good! Chimay has three beers that are well known around the world and a fourth that is only served at the abbey and nearby cafe. Chimay Red (Première) is a dubbel style with a beautiful dark brown appearance. In the US it sometimes tastes like copper making me imagine a tea made from pennies and sadness. I am happy to report that the penny aroma and flavor is nowhere to be found when you’re drinking it at the source. Instead you get a nice rounded and complex maltiness with raisin, coriander, fig, apple, a hint of cinnamon, and a swirl of other dark fruit flavors. The Chimay White is a Tripel style with a hazy golden straw color and one of the creamiest, white, sticky heads I’ve ever seen on a beer. The beer is very crisp and dry with some mild spice aromas and flavors, an upfront sweetness that is immediately replaced by a mildly earthy hop flavor that sticks around through the very dry finish. Chimay Blue (Grande Réserve) is a Belgian Strong Dark Ale that was originally only brewed for Christmas until the early 1950s. It clocks in at around 9% ABV, making it less potent than the strongest offerings from most other Trappist brewers (except for Orval which is nothing like the other Trappists and is perfect in every way). The beer that is only available at the abbey and cafe is the Chimay Patersbier. It clocks in below 5% ABV and and is a very refreshing beer. 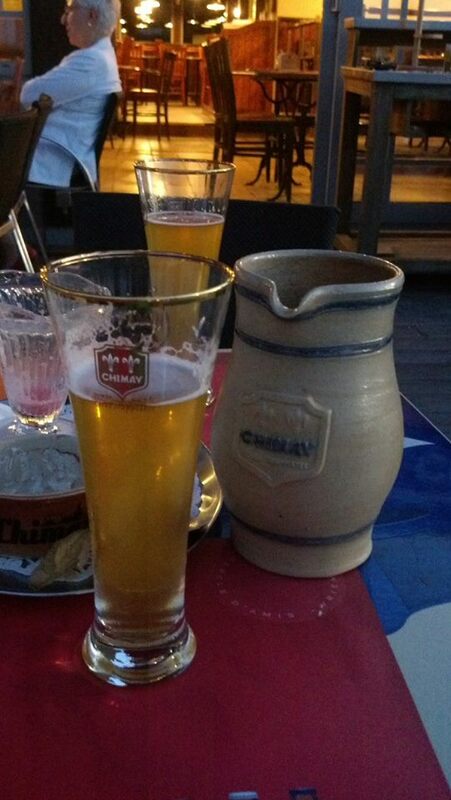 Chimay Paters Beer…about 5% ABV and similar to a wit. Tonight, we’re staying at the Inn at Chimay. It’s a couple of miles from the abbey, but it’s the “official” cafe of the monastery. You can drink all the Chimay beer you want, then walk 5 feet to your room! And Chimay Red doesn’t taste like pennies here!